My neighborhood restaurant is 18 miles away. The way I see it, being neighborly isn't a matter of distance, but of attitude. And there's no restaurant near my home with the attitude I find at the South Lake Italian Restaurant in Pasadena. Eating there is like joining an extended family. Strangers are introduced; drop-ins share tables, and the blonde with a pony tail who chats with everybody is Donna Starr, the owner. This eight-year-old restaurant in the heart of the Lake Avenue shopping district is small, cozy, intimate and very personal. The basset hound whose portraits line one wall is Donna's dog, Blossom, who attracts a throng of admirers to her birthday celebration at the restaurant each December. While the atmosphere and cordiality are big attractions, the food is good too, mostly pasta and pizzas. I can't speak for all of it because I'm a one-dish person. I only order the California chicken nut pizza, although the lasagna sitting on the next table the other night looked so good I might violate this tradition next time. At any rate, the pizza is my favorite--a thin crust brushed with olive oil, then topped with barbecued chicken, pine nuts, avocado, mushrooms, sliced zucchini and a light layer of mozzarella cheese. That and a glass of Merlot is enough for me. The scary news is that Donna might lose her lease. If that happens, she'll move the restaurant elsewhere. And wherever she goes, that will be my new neighborhood. South Lake Italian Kitchen, 524 S. Lake Ave., Pasadena, Calif. 91101. Tel: (626) 792-5984. Open Monday through Saturday from 11:30 a.m. to 9 p.m.
Argentina's signature cookie is the alfajor, a meltingly tender sandwich of plain sugar cookies put together with thick, sweet dulce de leche (caramelized milk) and dusted at the edges with fine coconut shreds. Now who could resist a combination like that? Certainly not I, as the confiterias (pastry shops) in Buenos Aires are well aware. I buy dozens to eat while there and more to take home, the latter usually smashed to crumbs by the end of the trip. I'm not eating crumbs any more, though, because I've found alfajores every bit as good close to home. They're alfajores de maicena from the Grand Casino Bakery in Culver City. 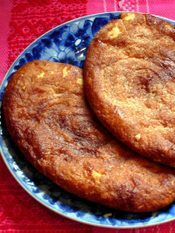 Maicena is cornstarch, and that's what makes these cookies so light and tender. You'll find other Argentinian pastries at the bakery too, along with yerba mate, sets for drinking mate and dulce de leche. 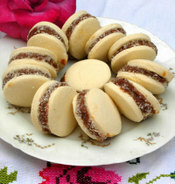 Alfajores de maicena are $4 for a box of 12 at the Grand Casino Bakery and Café, 3826 Main Street, Culver City, Calif. 90232. Tel: (310) 202–6969. Don't judge anything by its price. I paid more than $50 for a sun hat that I never wear—it's just too dorky. But I couldn't do without the 80-cent microwave rice cooker that I found in a thrift shop. Still, I tend to bow down mentally before a $50 wine and to scorn the lesser bottles set out for those who can't afford the best. This, of course, is ridiculous snobbery. Hide the price tags, banish the clever ads, the wine scores, the lists of medals from elite competitions, and a wine has to stand on its own. When I attended a private tasting at Vina Concha y Toro in Chile, the ambience alone made the wines seem fit for a royal cellar. The tasting took place in an imposing chateau on the winery grounds. I was the only guest, and I tasted appreciatively, marking the score sheets carefully and asking serious questions. "Fruity, smooth, very drinkable. I would buy this wine," I wrote by one of the reds, adding a star. I thought it ideal for the Mexican stews, Indian curries and other highly seasoned dishes that I like to cook. Back in Los Angeles, I found few of the wines that I tasted on that trip, but I did come across this one, and, of all places, at my corner supermarket. The real shock was the price—well under $10. . 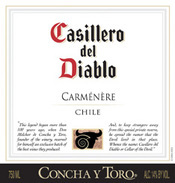 The wine is Casillero del Diablo Carmenere, $6.99 to $7.99 at many supermarkets. "Pinot Noir is my favorite red grape. The reason is very simple. It has red wine flavor with white wine texture. It's soft and not heavy . . . it feels like silk in your mouth." Sweet and crisp--I can't resist this combination, especially when I find it in pan dulce (Mexican sweet bread). The other day I dropped into Gigante Panaderia y Tortilleria on Western Avenue in Los Angeles. Checking the racks of bread that line the windows, I came across an extraordinary oval of crisp, flaky pastry, dark brown and glistening with syrupy glaze. Most pan dulce have fanciful Spanish names drawn from their shape, texture, or some other characteristic. But this one does not. "They're crispies," said the baker. I had hoped for something more imaginative, but no matter what the name, I'll be back for more. Crispies are 60 cents each at Gigante Panaderia y Tortillera, 936 N. Western Ave., Los Angeles. Tel: (323) 464-3139. If you don't speak Korean, you might walk out of YeYe, a friendly little café on the northern edge of Koreatown. The menu cards are in Korean, with no English translation, and the hostess doesn't speak English. But don't leave. Instead, sit down and say "chua tang." Like a magic password, this will bring you a bowl of steaming fish soup, a YeYe specialty. Cabbage leaves and bright green sesame leaves float at the top, but you won't see any chunks of fish. The delicate freshwater fish used in this soup has been ground to a paste and blended into the broth. Koreans appreciate chua tang for its healthful properties—it is said to increase stamina. Mild, rather than spicy like much Korean food, it can be eaten as is, or given a jolt of chopped green chiles or red chile paste from the condiment tray on the side. Other seasonings with which you can dress it up are tiny round wild sesame seeds, chopped green onions, garlic puree and sansho, a perfumed spice derived from the prickly ash tree, accompanied by a spoon so minute it holds only a few grains. Earthy rice cooked with red beans comes with the soup, and you can eat them together, spooning up a little rice, then soup. You also get an array of banchan (side dishes), which might include kimchi, sweet cubes of kabocha squash, bean sprouts, green beans with tiny dried fish, marinated daikon shreds and translucent cucumber slices. .
After you've eaten this fresh light food and sipped a glass of hot barley tea, you'll feel restored and invigorated. And you'll know that chua tang hasn't earned its reputation for nothing. Chua tang is $7.99 at YeYe Korean Restaurant, 946 N. Western Ave., Los Angeles. Tel: (323) 465-9090. Open Monday through Saturday from 10:30 a.m. to 9:30 p.m.